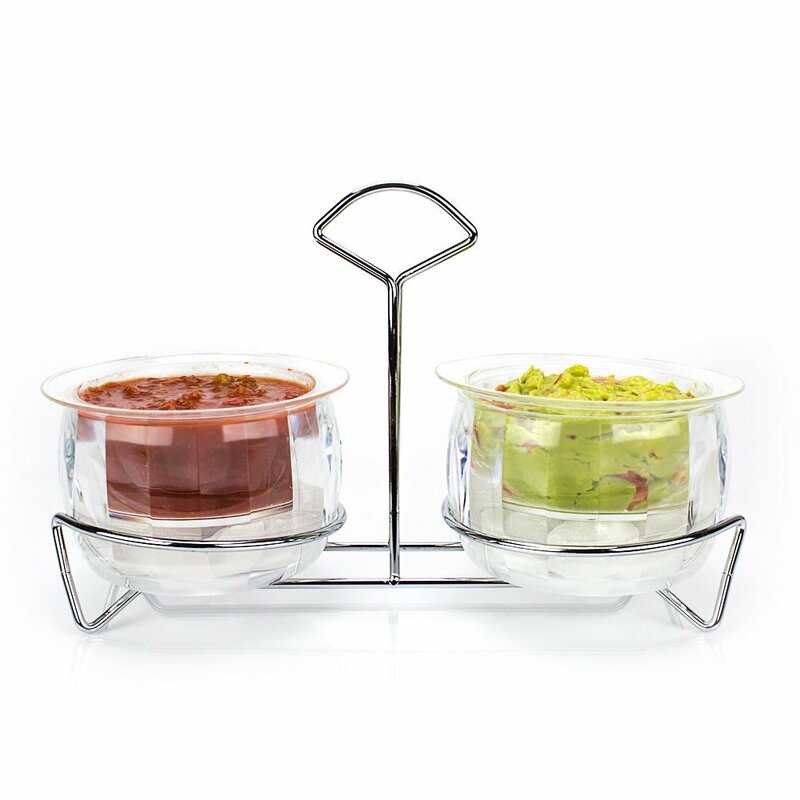 Double Dips on ice Serving Bowls-Keep Your Dips Fresh for hours.easy way to keep condiments,fruits,veggie,appetizers deliciously fresh and cool for hours. Keep your salads, meat, fish, fruits, vegetables, dips, fresh and cool throughout your party or picnic.Including Two dip bowls 2 acrylic ice bowls Chrome metal caddy.Place crushed or cubed ice in the lower tray, then place bowls on top to keep food chilled Great for keeping salad dressing, sauces, dips and condiments chilled. 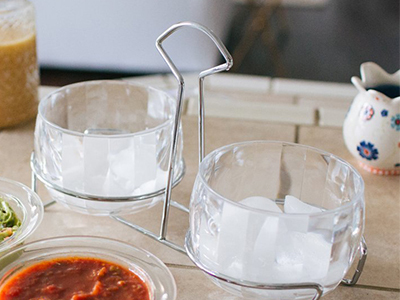 Prevent dressings, dips or condiments from becoming warm during a party by using the Double Dips on Ice.Two bowls rest inside a lower bowl that can be filled with ice to keep food chilled.It allow dips and appetizers stay cold for hours.Keep dips, seafood and your other delicious dishes at an ideal temperature for your guests. 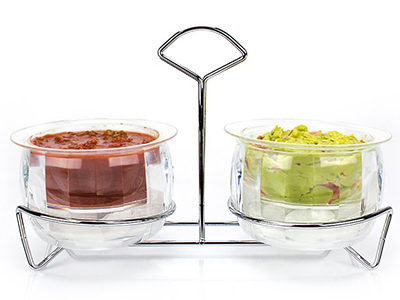 Prevent dressings, dips or condiments from becoming warm during a party by using the Double Dips on Ice. Including Two dip bowls 2 acrylic ice bowls Chrome metal caddy. 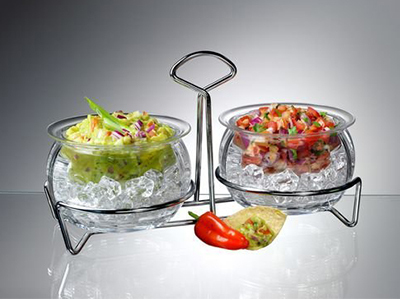 Two Dips On Ice bowl sets complete with stylish, heavy gauge chromed metal caddy. Conveniently carry and serve two dips, condiments or dressings, keeping them chilled and fresh throughout the party. Place cubed or crushed ice with water into lower bowl and position upper dip bowl so it rests down into ice water. 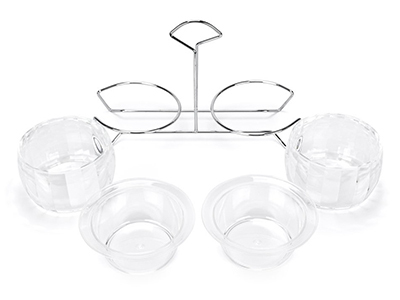 Use these twin dip chiller serving bowls on ice to serve a creatively plated seafood tray at your next big event, for instance. The acrylic serving dip bowl doesn't corrode, so you can count on years of use. The top spinach dip bowl nests inside the paired acrylic ice bowl for an attractive, inventive serving solution. This design also holds the top bowl stable, which is ideal for chips and salsa.